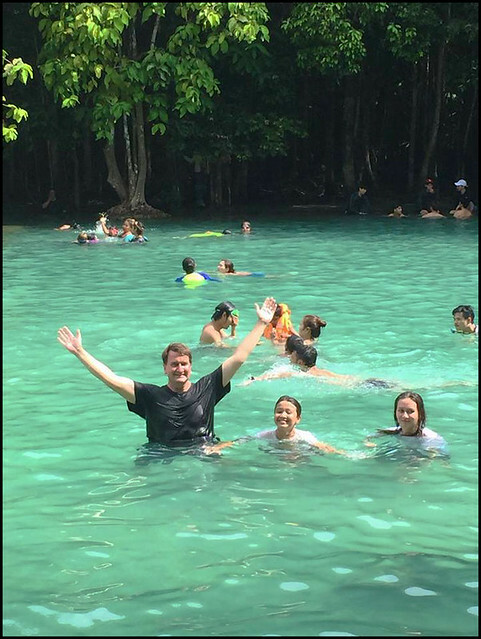 We had a very nice family trip to Krabi at the end of April 2017 (just a couple of nights away from Phuket). It's not too far, about 2 1/2 hours drive from our house to Krabi Town. We skipped the beaches, but had a couple of well known attractions that we wanted to visit. 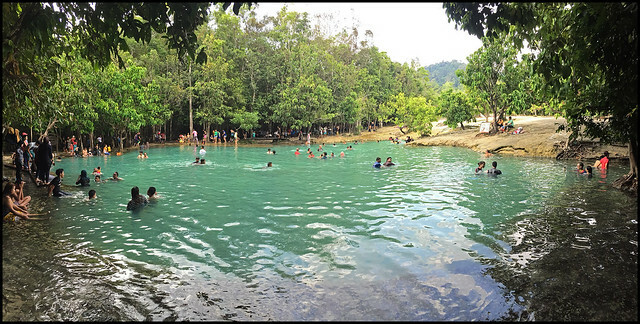 After checking in to our hotel we headed out of town looking for the Emerald Pool (Sra Morakot - สระมรกต). It's a bit of a drive, about 50km from town or 60km from Ao Nang beach. We stopped for a quick lunch on the way and found the entrance to the Emerald Pool at about 1:30pm. As expected, things looked busy. The car park was quite full. I can also suggest trying to visit on a week day and not a weekend or public holiday. 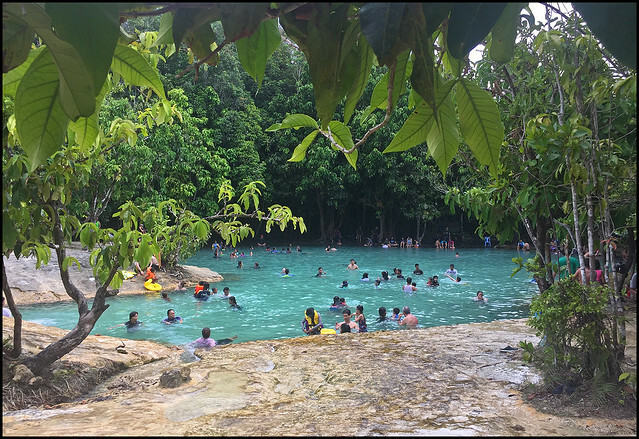 Having said that, it was not so crazily crowded and as it turns out there is more to see here than just 1 emerald coloured pool! There's an update at the end of this blog post - we visited again a couple of months later and went early - paradise! For Tours in the Krabi area, please do ask my friends at Easy Day Thailand! Entrance fee is the usual double price - foreigners 200 Baht for adults and 100 Baht for kids, Thai price 20 Baht / 10 Baht. At the entrance are a bunch of little food/snack/drink stalls, but please do note that you are not allowed to take food and drinks in plastic containers with you to the emerald pool. We did find a small shop selling drinks nearer the pool too. There are 2 paths from the entrance. 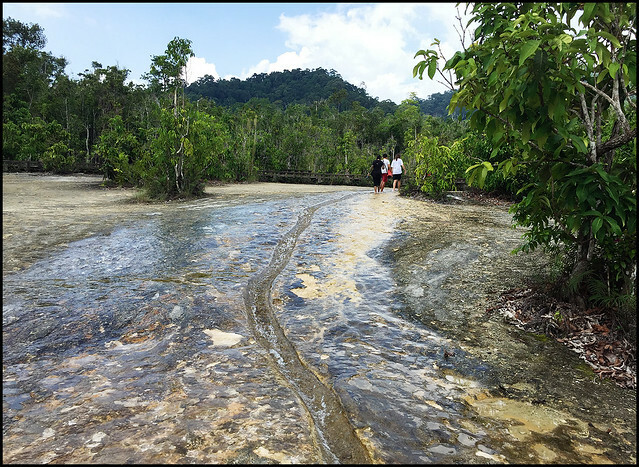 Most people were opting for the easy wide gravel path, but we took the narrow twisty path through the trees and mangroves. It's further - the sign says 1,400 meters by this path compared to 800 meters by the easy path. 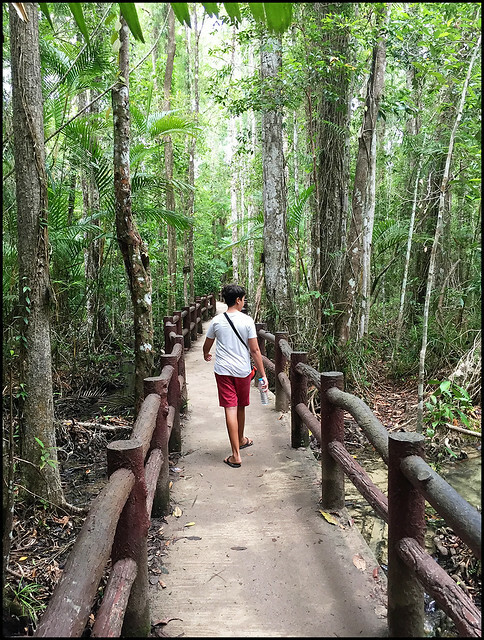 Along this walkway we were immersed in jungle and the stream that flows out of the pool was often near the path. 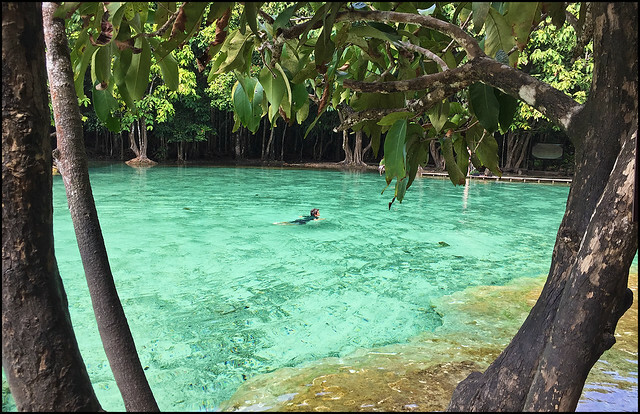 The water is mineral rich and leaves coloured deposits around the water. Looked like a prehistoric jungle. 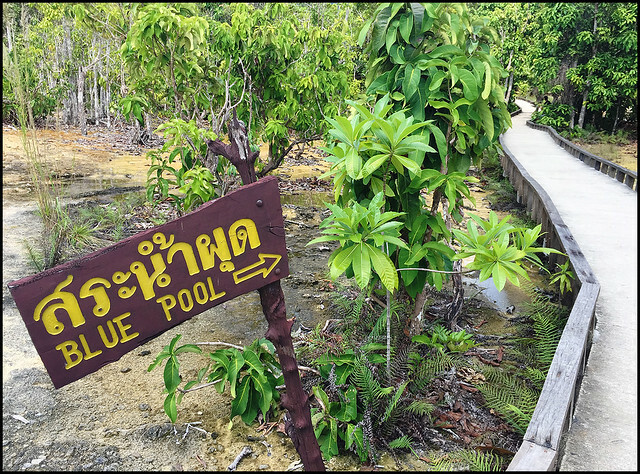 (above) On the way you pass this green pool called Sra Kaew (Glass Pool). It was a pleasant, crowd-avoiding walk. Took about 20 minutes including photo stops to reach the famous Emerald Pool. 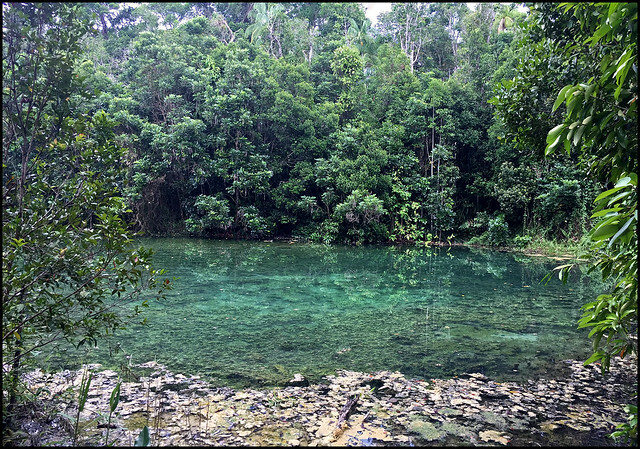 And the reason for walking past the emerald pool was to find the Blue Pool. About another 10 minutes of walking and hoping to find a place to jump in the water and cool off on a hot day. 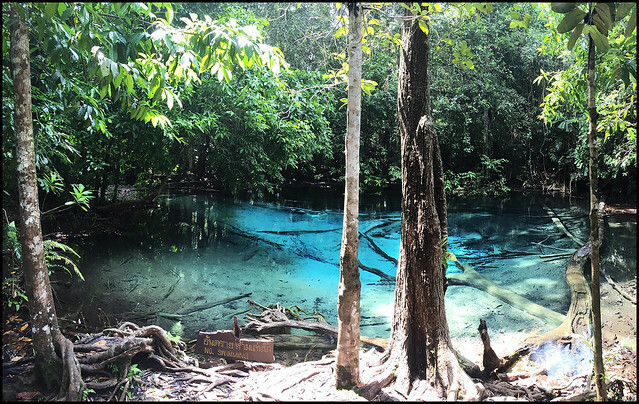 We found the rather beautiful blue pool ... Very blue indeed! 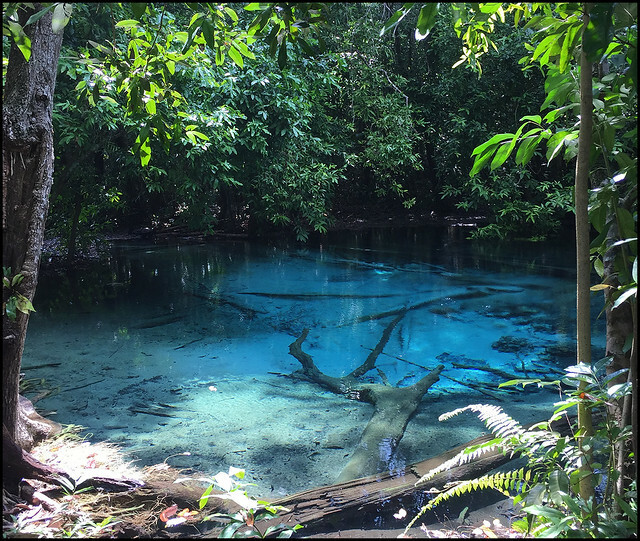 Certainly a wonder of nature, BUT you're not allowed to swim in the blue pool. The whole family was saying "I want to swim! ", but rules are rules. A sign said that the blue pool is a natural hot spring, with water temperature from 30 - 50 degrees C. So from here we walked back to the emerald pool and we did have a little splash about. I think during our short walk to the blue pool and back the number of people at the emerald pool had increased. Afternoons are certainly the busy time. Mental note made to visit in the morning next time! (above) Me and the kids at the Emerald Pool. We splashed around for half an hour. The water is certainly not cold, since it originates at the blue pool hot spring above. Getting in and out of the water is a little tricky - it's been left natural, no concrete steps or ladders! Although a little crowded, it was not too bad, not too noisy. This was a Friday, but during school holidays, so there were quite a lot of locals there. 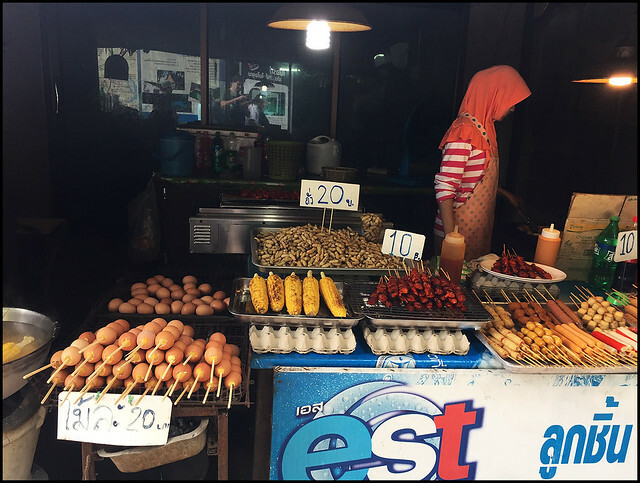 We took the quicker path back to the entrance to buy a few drinks and take the drive back to Krabi Town which takes about 1 hour. On the way we took a tiny detour to the entrance of the 'Klong Thom Hot Spring Waterfall', but decided to visit next day, as it was already late afternoon.